February is a very popular month for ski enthusiasts to hit the slopes. We’ve used our travel knowledge and put together a list of where we think you should head to for the best ski during this time of the year. Switzerland’s largest ski area with a number of amazing ski resorts Verbier possess a combination of beautiful scenery, a buzzing nightlife and some of the best ski slopes in Europe. This makes this destination very popular among the young sporty clientele and families. A big bonus is that it’s so accessible with the nearby Geneva airport only being a two and a half hour journey away from where all the action happens (you can travel by private or public transport). The ski run starts at around 821m of elevation however you can climb all the way to the top of Mount Fort which sits at a breath taking 3330m and offers incredible 360 degree views from the Matterhorn. If your confident in your skiing ability you can try navigate the famous world cup run in Mayens de-l’ours that is if you stick to the most direct route in which along the way you will find some of the areas best mountain restaurants. 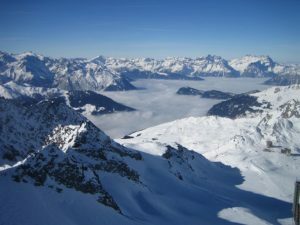 Gentianes – La Chaux – The most popular slope with the more experienced skiers to Verbier thanks to it’s range of challenging turns and runs followed by a nice decent into the valley. Along with this lovely run are some amazing views for you to enjoy as you glide down the side of a mountain, stop off for a hot chocolate at one of the many cafes located on the slope. Attelas – Carrefour – One of the more skilled skiers this will test the strength of your legs if you can complete the slope in one go then consider yourself a machine. Keep an eye out for the Carrefour restaurant which comes highly recommended by visitors to this area. Piste de l’ours – A decent of 900m again this slope is recommended for the more confident skiers, this slope is one of the most picturesque of the ones on offer in Verbier. Also home to the border cross competition which is worth keeping a eye out for as it is quite the spectacle. A number of beautiful villages form a ever popular ski resort in the French Alps. The nearby Val d’Isere connects the two resorts by a network of ski lifts all with their own unique slopes providing a great skiing experience for all levels from experts to beginners. Combine this with a world famous ‘Apres Ski’ and you have yourself the ultimate ski holiday! The ski area is known as ‘Espace Killy’ and is one of the best in the world when it comes to fresh slopes and infrastructure. The ski season in France is between December and May meaning the snow is at it’s best in February and here at Low Cost Deals we can arrange a package holiday perfect for you and the family to visit some of the best resorts in the area. 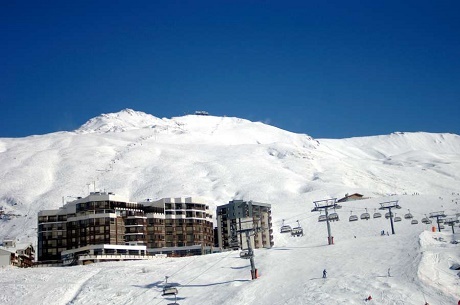 The nearest airport to Tignes is Chamberry which is around 2 hours away from the main ski area, we can arrange a transfer for you when you book your holiday. Flights will be busier and therefore more expensive during the school holidays so dependant on who you are planning on taking with you on your trip this is something to consider. La Sashe – One for the experts this is a long and difficult black run down to Tignes so we don’t recommend it to the less confident skier. Known to be a real leg burner this will certainly provide a fix for any adrenaline junkies out there. Orange – A lot less challenging than La Sashe, Orange is perfect for intermediate skiers. Two of the main runs down are the Orange and the Diebold which flow back towards Tignes, and on your way down you will come across the legendary Folie Douce so you can enjoy some apres ski with a couple of beers to help you down the slope. Grand Motte to Val Claret – This is the longest run of the three runs with a variation of black and red runs, meaning this slope is for the people who want to challenge themselves and their ski skills. Re fuel at the Aspen restaurant and scoff down a burger and beer which are known to be the best in town. 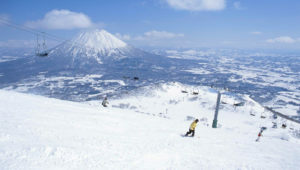 Hokkaido is the new go to place for ski enthusiasts willing to explore the new untouched slopes of Japan. Hokkaido’s slopes are in the perfect place for a constant dumping of fresh powdered snow with some of the best ski areas averaging a snowfall of 14-20 meters annually. Hokkaido provides a much more hipster skiing experience, with it being quite new to the country the slopes are a lot less untouched and the ski resorts provide a unique Asian experience which can’t be found anywhere else. Swapping the usual ‘apres ski’ for some ramen and seafood you will quickly adjust to this new experience and embrace it with open arms.